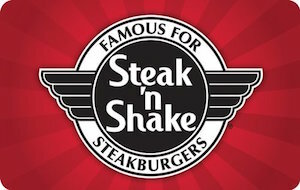 If you like steakburgers, fries, cheese fries, footlongs, chili, shakes, and more, then you are sure to love Steak & Shake! The only thing better than great food is paying less money for it! And if you buy a Steak & Shake gift card today for a discounted price that is exactly what you will get! Purchase yours today and start saving money on all your favorite menu items! Breakfast, lunch, and dinner for less money out of your wallet! For 83 years, they have been serving fast, delicious meals at reasonable prices. And just think, now you can buy a discounted Steak & Shake gift card and save even more money! The same food you love, for less! And with over 500 United States locations, you probably have one close to you! Get your card today and start saving money on an All-American favorite that is sure to please everyone in your group! From Chili cheese fries to patty melts, they have you covered! A discounted Steak & Shake gift card will stretch your dollar further on the very same food you love. And that’s not all! Cards2Cash offers many other excellent discounted gift cards for grocery stores, restaurants, department stores and more! If you would like to save money in other popular grocery store chains, then be sure to check out our listings for Kroger, Meijer, Trader Joe, Giant Eagle and others! Do you have a Steak & Shake gift card you want to sell? Great news! Cards2Cash buys lots of gift cards! In fact, we buy them for restaurants, department stores, websites and more. And the best part is, we pay top dollar for them! Why hold on to a card you will never use when you can have cash instead? If you would like to turn your unwanted card into money, then stop in one of our retail locations and we will pay you money right on the spot. Or simply fill out our secure online form and we’ll get back to you with an offer for you will surely appreciate! Cards2Cash is your one-stop stop gift card shop!